Angus Campbell lived in his family castle in Scotland, with his bedroom on top of a 50-foot tower. One morning his body is found on the ground below the tower, an apparent suicide, since the bedroom door remained locked and bolted on the inside, the only window inaccessible from the ground. A mysterious suitcase is found under the bed that wasn’t there when the door was locked. How did it get there after the door was locked, and more importantly, what was in it? As other family members arrive to settle the estate, a brother sleeps in the room and meets a similar fate—again with the door locked from the inside. 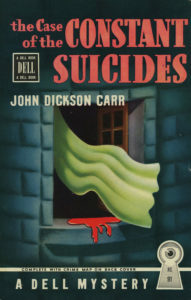 John Dickson Carr was the master of the fabled “locked room mystery,” the classic whodunit that featured a seemingly unsolvable crime that took place inside a locked and otherwise inaccessible room. His 1935 novel The Three Coffins (or The Hollow Man as it was published in Britain) was selected as the best locked-room mystery of all time. Carr was one of the best mystery writers of the Golden Age of the pulp mystery magazines. The Unionville, Pennsylvania, native published under his own name as well as the pseudonyms Carter Dickson and Carr Dickson. The man who invariably solved the mysteries was Dr. Gideon Fell, to my mind one of the great fictional amateur detectives in literature. A mixture of G.K. Chesterton’s Father Brown, Sherlock Holmes, and Professor Augustus S. F. X. Van Dusen (“the Thinking Machine,” created by Georgia’s own Jacques Futrelle), Fell was an overweight curmudgeonly British scholar who wore a cape and a shovel hat and carried a cane. Like Holmes, he observes everything and reveals nothing until he has the mystery in hand, though the reader is given exactly the same clues that he is. When he’s not solving murders, he works on his history of the beer-drinking habits of the English people. What’s not to like? The hardest part about reading Carr is finding his books; they are largely out of print, though some are available as E-books online at the usual places. As with so many great reads, I learned about Carr through Washington Post book critic Michael Dirda and was lucky enough to find this book at Second Story Books in Maryland. Whenever I go into any used bookstore, I scour the mystery section in search of Carr’s books and have struck gold several times. Carr died of lung cancer in 1977 at the age of 70 and is buried in Springwood Cemetery in Greenville, South Carolina. Like so many writers who enjoyed widespread fame during his lifetime, he is largely and undeservedly forgotten now. 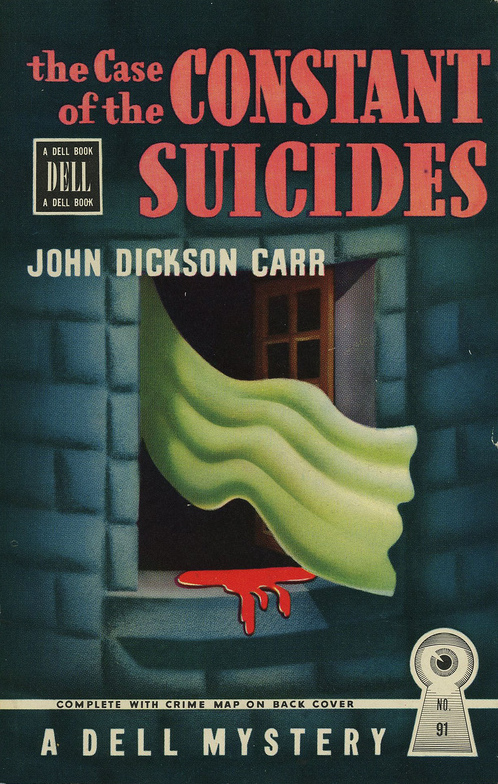 But if you love mysteries, put John Dickson Carr on your list. This entry was posted in Beer, Books, People, Writers on July 29, 2018 by Stan Deaton.